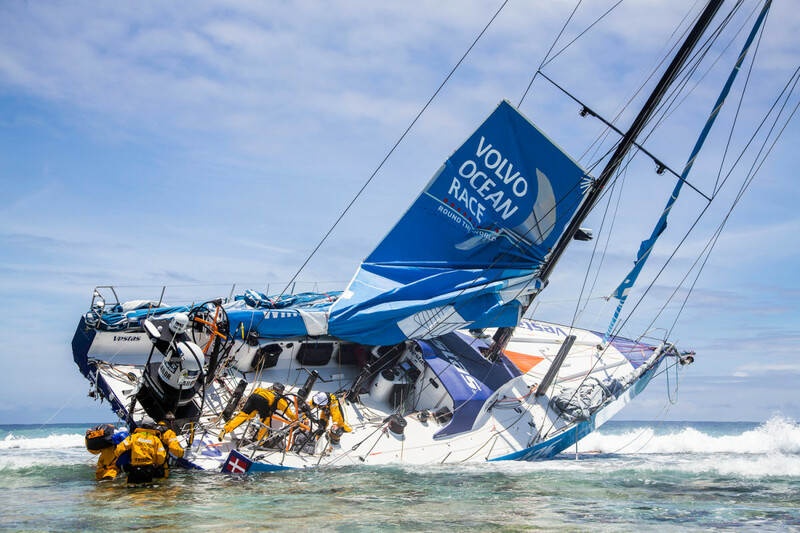 Team Vestas Wind skipper Chris Nicholson flew back to a remote Indian Ocean reef to help oversee a complicated operation to retrieve his stranded boat after it was grounded there during the second leg of the Volvo Ocean Race nearly three weeks ago. The 45-year-old skipper flew to Mauritius on Wednesday to join the team’s shore chief, Neil Cox, a fellow Australian who is leading the effort. Cox is one of the most experienced men in the business, but the challenge of freeing the stricken $6 million Volvo Ocean 65 from the grip of the reef in the Cargados Carajos Shoals (St. Brandon) is a new one, even for him. “The ultimate plan, the gold-medal prize we’re reaching for, is to get the boat buoyant enough to float across the lagoon to get it into more protected water,” Cox told race organizers. It has been there since the afternoon of Nov. 29, when the boat ran onto rocks at about 19 knots and forced Nicholson and the eight other men aboard to abandon ship. The skipper eventually led his crew to safety.